Isn't It About Time You Learn Exactly What Social Networks Can Do For You, Personally & Professionally? The Get Social Newsletter will provide you with proven and effective information, techniques and tips that will help you understand how social networks function, plus show you how you can use them to your advantage in your personal as well as professional life! 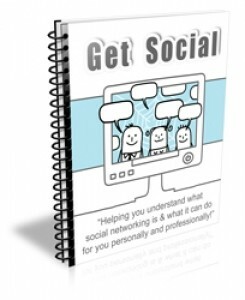 Are You Ready To Learn Valuable Information That Will Help You Exactly What Social Networking Can Do for You? Inside each issue of the Get Social Newsletter you will receive easy to understand information on what makes social networks so popular and how you can make the most out of all of your social network accounts. You will also learn some great tips and techniques that you can use to improve your profiles, make more friends and form long-lasting, beneficial connections! Inside every issue of the "Get Social" newsletter you'll learn valuable information on how you can get the most out of any social network you join! Exactly what social networking is, what type of social networks are available and what they can do for you professionally as well as personally. What makes some social network so popular and what they have to offer.